Edinburgh was freezing the night my partner and I headed to the Scotch Malt Whisky Society on Queen Street. I had spent fifteen minutes slipping and scuffing my way down tall hills in too-tall heels, wishing we had opted for a cab instead. But the hard work getting to the SMWS was all made worthwhile as soon as the first bright lights decorating the outside of the building came into sight. Everything about the grand old place spoke of warmth and friendliness – I could see chattering groups of people smiling by candlelight inside and I couldn’t wait to join them. 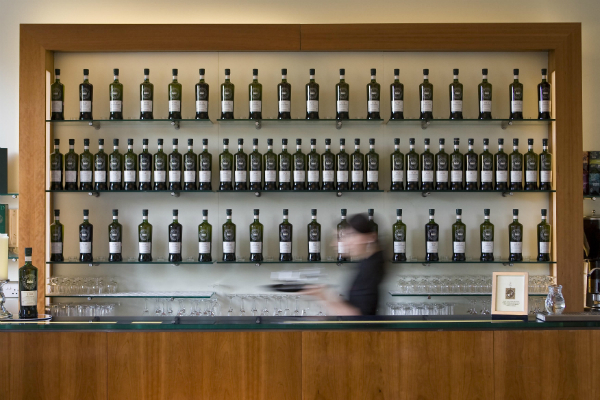 The Society is a private members’ club for those who love their whisky – it sells only single cask, single malt whisky and those drams are available exclusively through the SMWS. 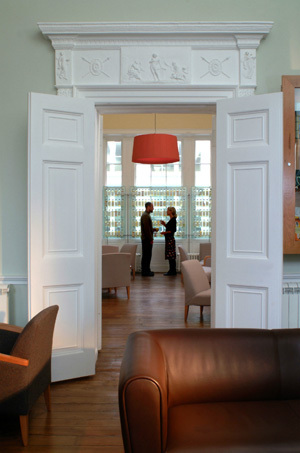 It has two main locations in the Edinburgh area – the one just off Queen Street and the other in nearby Leith, which was the original home for the Society which started in 1983. Luckily, while the upstairs rooms at the Queen Street location are limited to members, the downstairs Dining Room restaurant where we were headed is open to all – so long as you book in advance. Guests can choose to have a four-course tasting menu with each course paired with either a whisky or a wine, or they can order a la carte. As everything on the taster menu took our fancy, we were keen to push the boat (and our waistlines) out to try it all. The maitre d’ was fantastically knowledgeable, having chosen many of the pairings himself. He took us through each course and explained why he thought both the wine and whisky would work, making it difficult for us to decide. We started with an amuse-bouche of smoked duck, with pomegranate and toasted brioche that was so well layered it could have survived a trek out in the freezing Edinburgh night. The meaty smokiness of the duck hit you first but was light enough to allow our taste buds to move onto the bright pomegranate flavours and the final sweet crunch of brioche. Paired with a Bowmore single cask whisky that was slightly peated but with a dancing vanilla and fruit finish, this tingling beginning was near-on perfect. As it happened, my next favourite dish of the night was the first starter – crispy fried hand-dived scallops with orange and bay sauce, chorizo and dried black olives. There was a thick sweetness to the sauce, that matched the plump and juicy scallops and bourbon-influenced 13-year old Auchentoshan divinely. The intense salty addition of chorizo and dried black olives made it pop in the mouth. It would have been a lovely dish without those sharp extras but putting them in showed the chef had vision. For the second starter, I opted for the English sparkling wine from Coates & Seely, while my other half stuck to the whisky. I was too curious to sample the former to miss out. Made from Chardonnay grapes, it had a distinct nuttiness and crisp acidity that cut through the creaminess of the dish – a Jerusalem artichoke veloute, with Brussels sprouts leaves, roast chestnuts, red wine artichokes and gougeres. My partner’s 24-year old Jura dram, meanwhile, had a salty seaside, citrus and almost cheesy note to it that worked wonders. My least favourite dish of the night was the loin of venison with Lapsang Souchong and orange sauce, caramelised chicory, baby beetroot and potato dauphine. I was quickly reminded upon first bite that I don’t, in fact, particularly like venison. My partner lapped his up, however, along with some of mine. Paired with a bold, peppery Cotes du Rhone, it would have easily pleased most people who aren’t so adverse to a bit of Bambi. When finally we got to the dessert, I didn’t think I could eat another morsel. But, a quick look out the window at the shivering, frosty-breathed passersby quickly changed my stomach’s mind: I could handle more food before I could handle the cold. While the dessert (a pistachio cake with preserved cherries, lemon curd and whipped mascarpone) was beautiful in presentation, it was the whisky I enjoyed most – a 26 year old Speyside dram from the fantastic Mortlach distillery, leaving me feeling thoroughly pleased and – most importantly for my upcoming walk back to our hotel – entirely warmed through. The dining experience at the SMWS was on par with some of the top restaurants I’ve eaten at in London – and, certainly, at a more reasonable price. Every dish was executed with skill and the fact there was a choice of either wine or whisky for each will make it appeal to those that aren’t so keen to drink whisky throughout an entire meal (but, with the drams as good as they are at the SMWS I recommend not missing out entirely). I’d happily go back in a heartbeat – even if it meant stumbling my way along ice-slick pavements to get there. 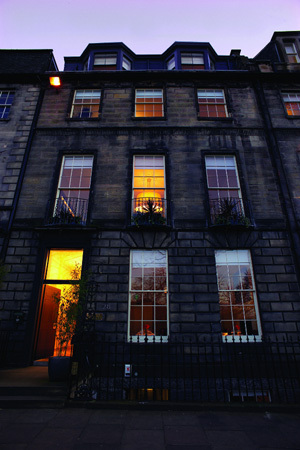 The Scotch Malt Whisky Society’s Dining Room Restaurant is located at: 28 Queen Street, Edinburgh, EH2 1JX. For more information on its menus, opening times and to book, visit the website.